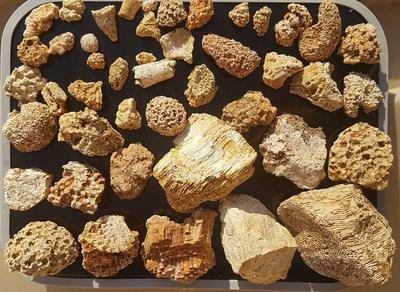 Found locally , in prime locations of red clay beds perfectly preserving the ancient corals. Wish I had closer related dates of their living time line of exestance... Have hundreds of these whole ancient corals and plants from same era . Hoping to also share soon. If response is positive will share all . The better quality photos I can't send yet . But , hopefully soon can post photos at same quality that they originally had been shot in to fully appreciate the intricate detail left buy theses beautiful treasures. Your part of Tennesee is covered with rocks from the Ordovician Period. The Ordovician began about 490 million years ago and lasted for about 47 million years. So that is your time frame.